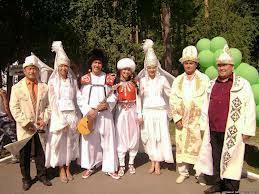 The main emphasis in the creation of Kyrgyz National clothing is the heat preserving. Winter clothing was made on the basis of cotton, furs of wild animals and felt. 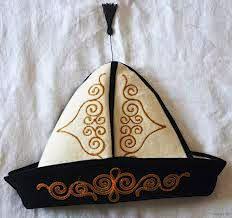 It is known that the Kyrgyz people have worked on the land since ancient times, but the most of them led nomadic life, so the traditional Kyrgyz clothing is inherent features of nomad’s clothing. Outdoor clothes is mainly was made of wool pets, but the most popular clothing was made of raccoon, sable and fox skin. There was a difference between ordinary people and rich people. Clothing of poor people was made from calico, while the clothing of rich people was made from silk, velvet and brocade. The traditional men’s costume consisted of shirt (koynek) and trousers (shym). The shirt “zhegde” was sewn from calico; the length was below the knee. Men began to wear this type of clothing since 6 years. A man’s costume also included robe. “Ak-kalpak” is ancient Kyrgyz head-dress, protecting from heat in summer and cold in winter. “Kamentay” is a wide coat, protecting from cold and rain. It was possible to determine the owner’s status by color and accessories. The traditional woman’s costume consisted of a dress and wide trousers. Young girls wore clothes made of bright silk fabrics. “Koynok” is dress-shirt which was worn over the “chyptama” (sleeveless velvet jaket, embroidered with black color patterns). “Maasy” is women’s shoes embroidered with black color patterns. “Beldemchi” is clothing that is worn after the birth of child. It is a kind of skirt,made of black and colored velvet. Its main accessory is the belt “bash beldemchi”, made of the felt and covered with black velvet cloth.